On the 30th July 1506, Lord Herbert and Lady Elizabeth agreed to establish and maintain the chapel already built and dedicated to Our Lady at the lower end of the South Nave Aisle. This chapel would serve as their burial place, and later come to be known as the Beaufort Chapel. The tomb of Charles Somerset, 1st Earl of Worcester, is a magnificent structure, made of Purbeck marble, and surrounded by a bronze screen. The alabaster effigies of Charles and Elizabeth, his first wife, show him in armour, wearing his Garter mantle and robes, while she is clothed in a mantle bearing her husband’s arms. It occupies nearly the whole space of this small chantry chapel, making a grand impression fitting for the people it represents, considerable and powerful personages in Tudor history, and descendants of Edward III himself. However, as this photograph taken by John Harrington in 1872 shows, this monument was for many years accompanied by another, equally grand, structure. This was the tomb of Henry Somerset, 1st Duke of Beaufort. Born at Raglan Castle, Monmouthshire, in 1629, Henry Somerset was an avid Royalist and Stuart supporter. During the Commonwealth, much of the family fortune was lost, sequestered by Parliament, and he spent many years trying to restore it. On inheriting the Badminton estate in Gloucestershire from his cousin, he made it the family home, Raglan having been destroyed. Badminton continues as the seat of the Beaufort family today. On the restoration of the Monarchy, he was appointed Lord Lieutenant of Gloucestershire, Herefordshire and Monmouthshire, with the task of seeking out rebels and plots against the government. In 1672 he became Lord President of the Council of the marches of Wales, a privy councillor, and in June a Knight of the Garter, signifying his favour with the King. This was further acknowledged when in 1682, he was created Duke of Beaufort. He died at Badminton on 21 January 1699/1700, and was buried in the Beaufort chapel alongside his ancestors. 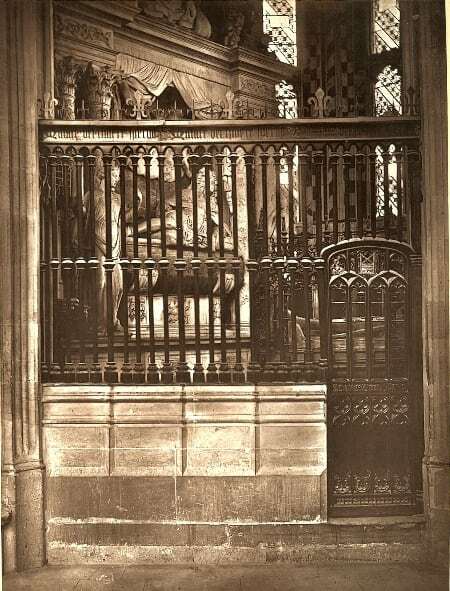 Just two years after this photograph was taken, the monument was removed to the parish church at Badminton and erected in a new Chancel specially built for it by the 8th Duke. In October of that year, 1874, the Chapter Clerk Richard Cope noted that “a flat oblong marble with a long inscription in Latin was brought from Badminton to be fixed either against the wall or laid on the floor of the Beaufort Chapel” [SGC XVIII.9.3]. This marble tablet is all the evidence that remains at Windsor of the once mighty monument to the 1st Duke of Beaufort.